‘There’s no T (for talent) in their postcode,’ was my favourite line from a young person having fun at the excellent Braintree Foyer / SAHA awards night. I turned up perhaps without my advantaged thinking head on, assuming by the last minute invitation that I would be mingling in the Foyer common room over some crisps and dips. I should have known better. I had already failed to win the Foyer Federation best dressed staff award earlier in the day, and now, I was being taken by bus to a sit down 3 course xmas dinner with the SAHA Chief Exec present, with everyone else dressed up to the nines. What mattered most though was seeing the young people enjoying the moment, celebrating their own achievements, supporting each other. These certainly were not the images from a Disadvantaged Thinking advert. The Foyer highlights magazine notes that, ‘At Braintree Foyer we focus on inspiring our young people to develop their talents and aspire to great things. To do this we invest in challenging opportunities which will motivate and stretch our young people.’ This is a service that has not just been touched by Open Talent, but is running with it. Meeting the CEO of SAHA, I was struck, rather like with Gwalia yesterday, that here is a large housing association working to embed Open Talent into its core practices and culture, reaching into the very heart of its staff HR policies. With such powers for change, and many more in the network, Open Talent really is on the brink of a massive breakthrough over the next year. The highlight of the evening was watching a duet from a young person – I believe one of our talent champions – and his support worker, who stepped into the breach to help share that scary moment when you are under the spotlight for the first time. What a performance it was. It enabled the young person to take on his own act afterwards, with all the confidence of someone who is clearly going places in life. This is exactly the sort of thing that won’t be in the complex needs support manual, singing a young person to the top of their talent. We have recently been able to announce the beginning of an Open talent pilot in Braintree for 2012, with Youth at Risk, as part of our investor relationship with SAHA. So, I decided to wrap up one of my orange T-shirts from my TedX performance in Greece, and hand it over as a symbolic gift for the New Year. 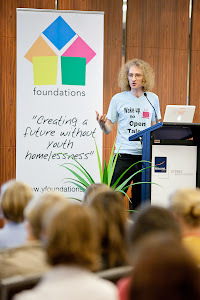 I hope it will bring them good fortune, and perhaps inspire them to make me a better t-shirt for the next time I speak! On the way home, I re-read a piece of paper from an Xmas cracker telling the story of ‘that adventurous and forward thinking Tom Smith’ who invented the cracker concept from a trip to France in 1840. Originally based in Clerkenwell, like the Foyer Federation, (who also discovered their reason for being from a trip to France) Smith watched his idea evolve over the years, until he eventually moved to the City and left his business to his sons, one of whom would tour the world to find new and unusual ideas for gifts to include inside. (I’m already thinking of changing my job title to that). Opening with a bang, wearing a new ‘hat’, celebrating with each other, looking forwards to what’s inside – the history of Tom Smith has more than a bit of Open Talent to it. Maybe next year, we’ll make our own.